As soon as it comes to the Internet and information technologies, we immediately reminded of the security. In recent years, the world rocked the numerous scandals related to identity theft, illegal surveillance of users and creation of entire systems to track any “electronic footprints”. Due to the rise of terrorist activity the authorities of various countries seek to maximize control the behavior of potentially dangerous persons and groups with all available means. While in developed democracies the judiciary is already sounding the alarm, trying to counteract the excessive intervention of the security services in the private lives of citizens. (See, for example, the May US Supreme Court decision on the illegality of phone records by the NSA), in Russia due to the virtual absence of separation Authorities, such does not occur. However, the result is always the same: “competent authorities” are not going to retreat, and under the pretext of deeper invade the privacy of a simple layman. Of course, as noticed by Newton, every action is a reaction, so one of the most popular apps, extensions and network services have now become a means of ensuring anonymity and circumvention of all possible systems of surveillance and restrictions of user actions. And if real terrorists skillfully hidden behind a variety of hardware and software complex, then for a simple user successfully spying on its own browser, through which you can fairly quickly and without further tweaks to collect complete and accurate information, not only about the way of life and political preferences, but also on the movements and future plans. 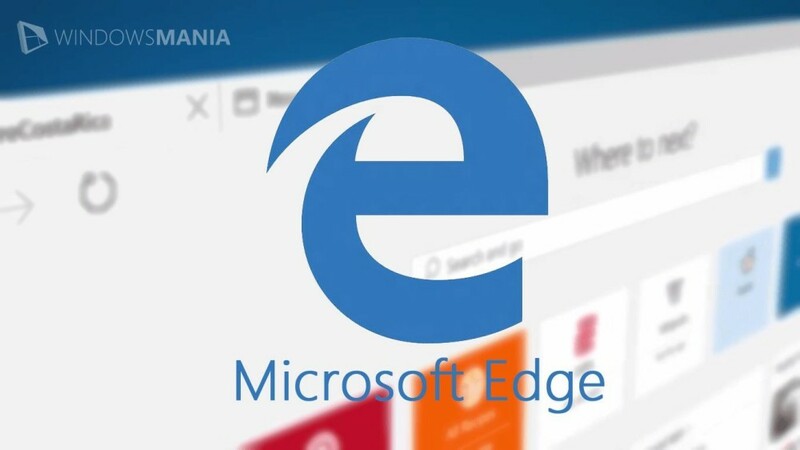 We will not talk about the specialized browsers like Epic or Tor – is a completely separate big topic.Let’s talk about the usual and familiar to many Firefox. Why is it about him? The fact is that from the big five – Internet Explorer, Firefox, Chrome, Opera, Safari – this is the only truly free browser open source. Anyone can personally verify the absence in it of any bookmarks, or secret passages, abandoned by developers in order to obtain remote control over the actions of the user. However, only one browser enough to be confident in their own network security. We need a variety of extensions and plug-ins that perform their own narrow, but important functions. Which of these Firefox Security Plugins is certainly install on your Firefox? Extension HTTPS Everywhere can be called “King of plug-ins.” It was developed jointly by the Tor Project and the Electronic Frontier Foundation (Electronic Frontier Foundation, EFF), the organization that fights for civil rights in the digital communications. HTTPS Everywhere there are versions for Firefox, Chrome, Opera and Firefox for Android, and its main function – ensuring encrypted data through a browser over HTTPS. You probably noticed that when you go to the site of his bank, make out some purchase through the card or fill out an application on the portal of public services, in the browser address bar appears a distinctive clasp, and address changes from http to https. This means that data sent over SSL / TLS between the browser and server is encrypted and can not be caught in the open form. HTTPS Everywhere includes a forced regime for all the pages do not support this encryption. Optional SSL Observatory can automatically check the validity of the electronic SSL-certified sites and at the same time to conceal information about who is visiting a site with a digital signature. 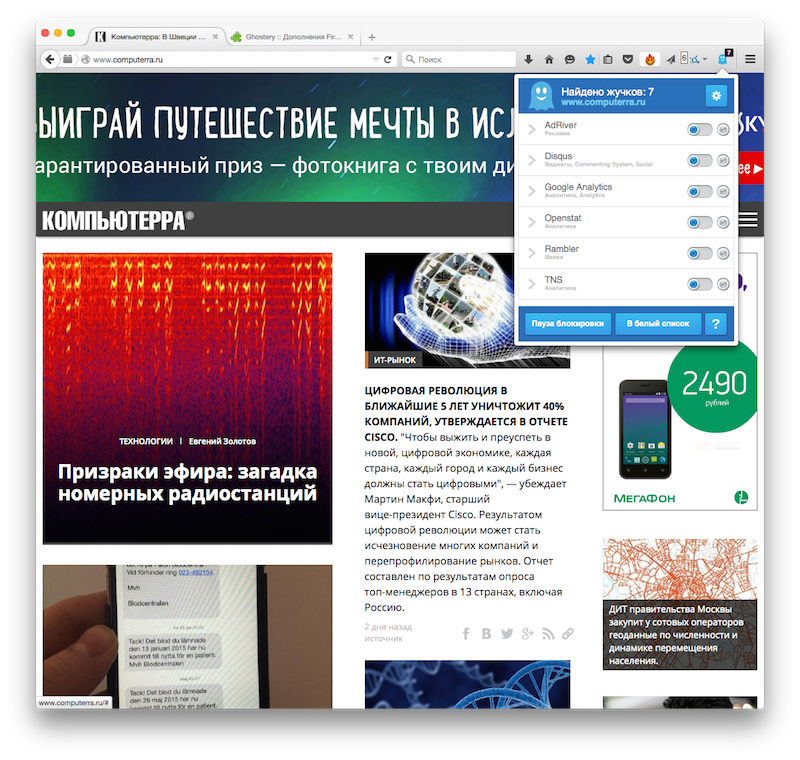 The plugin Ghostery looks you visit the web page and in identifying Web trackers, that is, elements of surveillance (widgets, invisible pixels, and the like) that collect data about the user and his activities on the Internet, automatically blocks them. In Ghostery is a function Ghostrank, which, according to developers, collects anonymous statistical data about detected bugs and about sites on which they are found. Some believe that in fact it can perform the tasks of the same bugs, which it blocks, so if you basically do not like about you collected some data, you can turn it off in the settings. Interface Ghostery Russified well, and all the settings are intuitive. 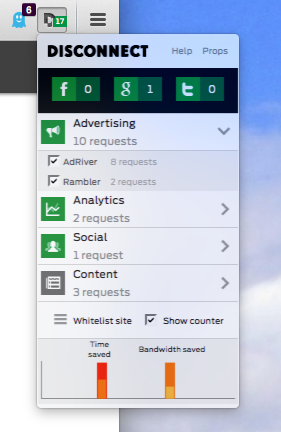 As Ghostery, Disconnect – this extension, blocking web trackers that collect your personal information through a browser. This is so effective that the magazine Popular Science http://www.hcp.com/disconnect-wins-popular-science-best-of-whats-new-award-2013 named him one of the hundred best innovations of 2013. Since Disconnect blocks tracking elements from more than 2,000 sources, it greatly speeds up the loading of pages – according to developers, the growth rate can be up to 27%. The plugin NoScript for immobilizer active scripts on sites you visit. Supplement permits active content to run only from sites you trust, and protect you from XSS-attacks and ClickJacking. To allow startup scripts need to make appropriate sites to the white list – the rest of the page will be automatically blocked. Expanding uMatrix – quite a fresh design, and it should carefully consider if you are really concerned about security. In a nutshell, uMatrix – a dynamic firewall that allows you to block all types of requests coming from the web server to your browser – scripts, pop-ups, advertising, trackers, etc. Interface uMatrix a red-green tablitsu- “matrix”: to accept or reject a request, just click the mouse on the appropriate box. This is a more advanced plug-in than the usual blocker, and you will be able to more flexibly adjust the permissions for different queries. 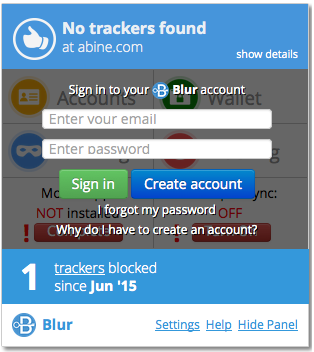 Blur – is our old friend: before the extension was called DoNotTrackMe and we have alreadyrecommended two years ago. This plugin not only block web trackers, but also acts as a password manager, payment details and other sensitive information, encrypt and protect them from interceptions. If you buy a premium account ($ 5 per month), you get the ability to make online purchases without entering information about your credit card: software company Abine Inc provides a service disposable cards. All modern browsers have a built-in password manager, but usually it seriously inferior to the functionality of a standalone program. 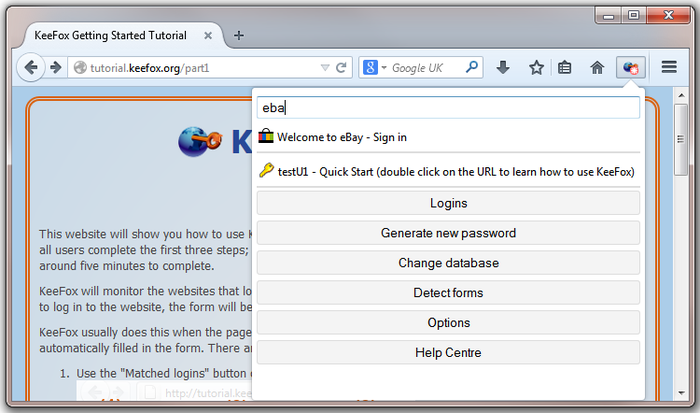 KeeFox – is turned into a Firefox extension version of KeePass, which is a full replacement for the built-in manager with many additional features. KeeFox plugin is open source and completely free. 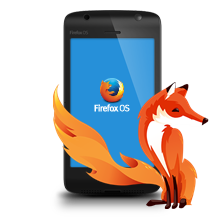 At installation pay attention to the fact that it will not work properly if the setting in Firefox is a remote passwords from memory each time you close your browser. 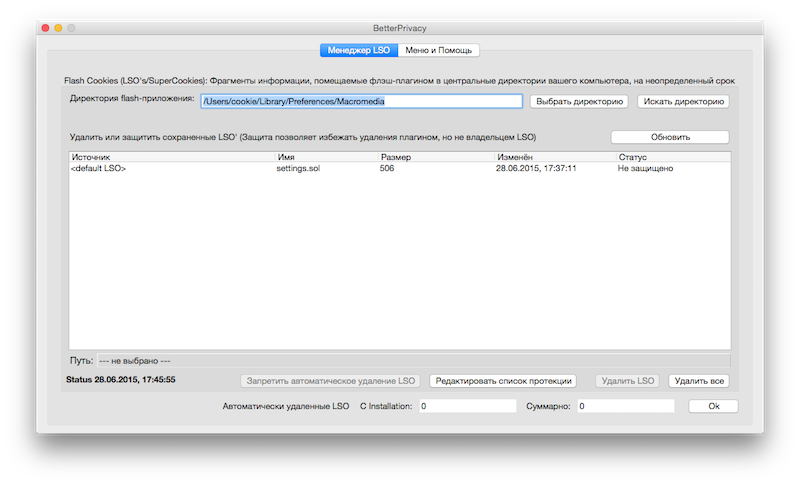 In addition, it does not support the version of Firefox for Mac OS X. Despite the fact that the plug BetterPrivacy not been updated much since 2012, he not only kept the urgency, but perfectly fulfills its function. BetterPrivacy deals with a special kind of files cookie – LSO (Local Shared Objects), or Flash cookies.These “superkuki” associated with Flash-player, and they are designed to save different settings on the user side, so that when you visit a site they did not need to be re-entered. Their main disadvantages – they do not expire and may be stored indefinitely, in addition, they occupy not less than 100 kilobytes of memory, while a conventional cookie – about four. These files are exactly the same as the standard cookies to track user activity on the Internet. This browsers do not always know how to remove them, but it is up to the task copes BetterPrivacy. However, it does not always have the time to deal with the usual cookies. Those who are too lazy to clean the memory of your browser manually or close it to remove the loaded garbage useful extension Self-Destructing You Have Cookies. The main advantage of this plugin is that it is able to delete cookies immediately after the closing of tabs: Table is open, there are cookies, and after it is closed, they are immediately destroyed. This method of removal allows you to effectively deal with these types of files as Zombie-cookie, which are restored from backups outside of the browser, or a cross-browser superkuki Evercookie, which are stored directly in eight places. 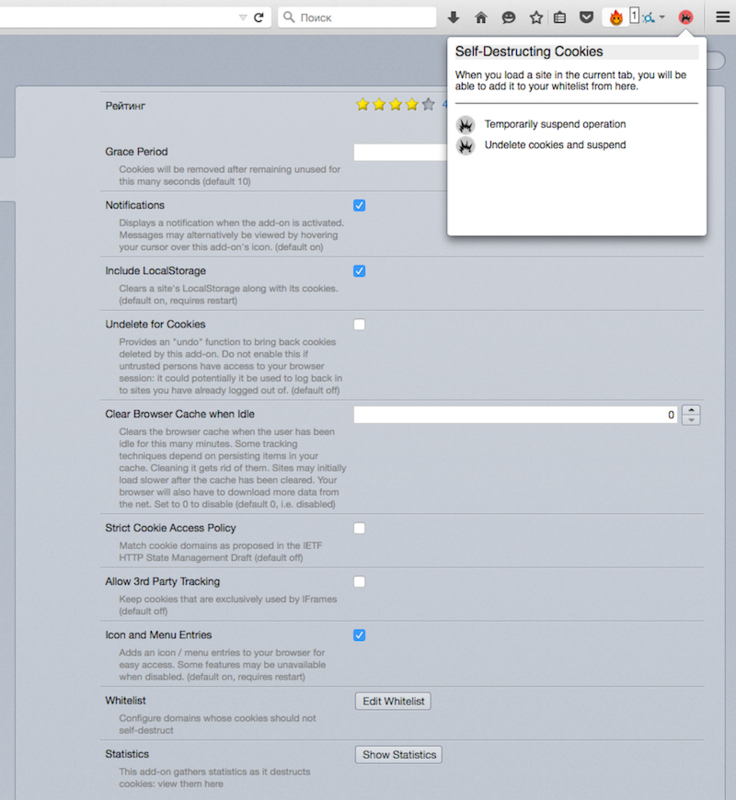 The extension provides for a white list of sites, cookies you do not want to delete. 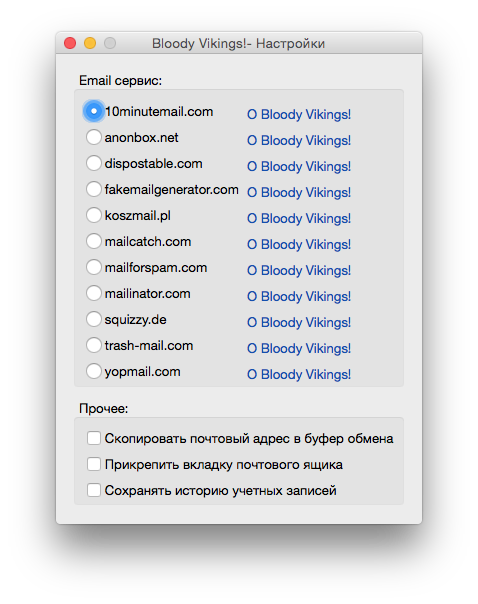 Under the strange name “Bloody Vikings!” Ckryvaetsya useful extension Bloody Viking!, Allowing to use disposable e-mail addresses for spam protection. Using network services like 10MinuteMail AnonBox and you get a temporary mailbox with a limited duration, with which you can, for example, to register at different sites and receive confirmation letters, without revealing this email address. After a predetermined period of time such disposable addresses and boxes simply disappear. Finally, a convenient plug Clean Links, allowing to transform complex long and intricate hyperlinks in clear and understandable options without unnecessary waste. Due to this expansion, you will not find yourself in the fraudulent phishing sites, thinking that you are in your online banking. Or simply will not fall for the bait unscrupulous webmasters who wanted to trick you open a whole bundle of advertising pages.